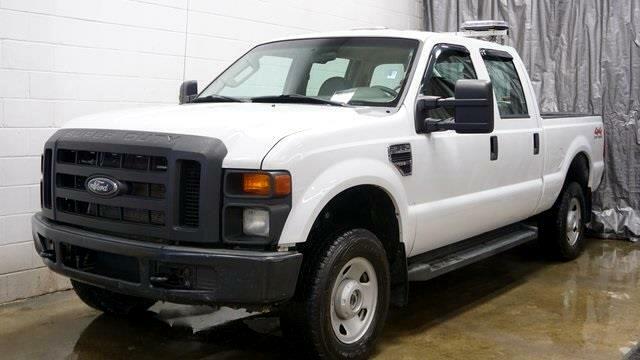 2008 Ford F-350SD XL 4x4 CREW CAB CARFAX One-Owner. Clean CARFAX. 4D Crew Cab, Triton 5.4L V8 EFI SOHC 24V, 4WD, White, 4-Wheel Disc Brakes, ABS brakes, AM/FM Stereo w/Digital Clock, Dual front impact airbags, Front reading lights, Low tire pressure warning, Passenger vanity mirror, Power steering, Rear reading lights, Rear step bumper, Tachometer, Trip computer, Variably intermittent wipers. Specializing in all makes models of trucks both diesel and gas. We have vehicles that no body else does. Please call us directly at (330)765-1200.